The author has presented a compilation relevant to the Muhurtas from the Vedic Shaastras, Samhitas, Muhurta Shaastras and Swar Shaastras, having a treasure of knowledge blessed by our sages and exponent acharyas. 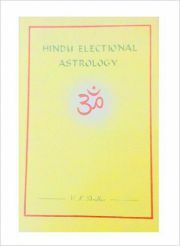 It is written in a style that beginners in astrology and even follower's of western system can grasp the subject with ease and derive benefits in its practical application. Swar Shaastra (phonetics) has been for the first time written in Roman script. The compendium includes more than 300 illustrative tables and diagrams to explain the subject and serve as ready reckoner. Prescriptions of more than 250 elections (Muhurtas) of life undertakings have been detailed (in Part II of the book) with opinions of the exponents. Theoretical aspects (Part I) of the elections illustrate philosophy inherent in elections and astrological database (Part III) provides valuable assistance.